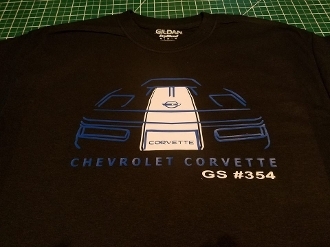 1996 GRAND SPORT CORVETTE C4 SILHOUETTE T-SHIRT. CAR HAS COLORED LIGHTS FRONT AND REAR. CHOOSE SIZE AND COLOR. YOU CAN CHOOSE TO HAVE THE PRODUCTION NUMBER ON THE SHIRT.